It is cold and windy in Toronto. It is hard to believe that only two weeks ago we were riding in our T shirts… As I mentioned to you few times this trip was the best experience I have had in a long long time. I fell in love wit the Desert. Even now I can close my eyes and see those hills, and animals running through them. And the sky… a lot, a lot of sky. You may have noticed how much I have enjoyed the tour. Everything, I mean everything, was close to perfect. The horses, the scenery, the group, the food, dinners at your friends houses and most importantly you and your crew, Your personal touch is what made this trip so special. I feel I made a friend and if you ever decide to visit Canada you are more than welcome to stay in my house. Now I am hooked. 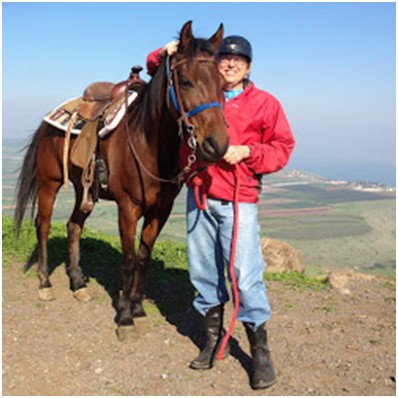 I have tried many different things in my life: skydiving, hang gliding, sailing, running marathons but nothing comes even close to the enjoyment I got from our trip through Israel. I may have to get a second job because this activity is not cheap, but I do not care. I am already planning my horse riding trip through Iceland. I got in touch with Chris, and we are working on a package. I hope to be there in July. It looks very attractive on the internet. I hope it is as good in reality as it is on pictures. Usually we get less than what is being advertised, but in the case of the trip with you, I believe I got a lot more than I expected. Thanks again, All the best to you and your family. Hope to see you again some time.